I won two awards this year, and it made me feel pretty damned proud (although I didn’t have an opportunity to deliver an acceptance speech). The most recent was for the new blog sheBOOM, targeted at women in service businesses. It’s called the Hermes award. (Sadly, I didn’t get a handbag…it’s not THAT Hermes…but I was thrilled anyway.) Another was for being a Constant Contact All Star. Plus, one of my pithy and witty (apparently) statements was selected to appear on a Women’s Quote-of-the-Day Calendar for 2016. From my mouth to your desktop…what a concept! But enough about me. My time for an “acceptance speech” has run out and I’m being muted. Our client Booker is heading to a marketing conference this week as nominees for two Revvie awards. They are the only company to be nominated in two categories. They also just won a Silver Stevie Award for best marketing team. (Lots of business awards seem to have short names that end in “ie.” Perhaps that’s easiest to engrave on a trophy or a lucite block.) In talking to Booker, I’ve learned a lot about the marketing award world. 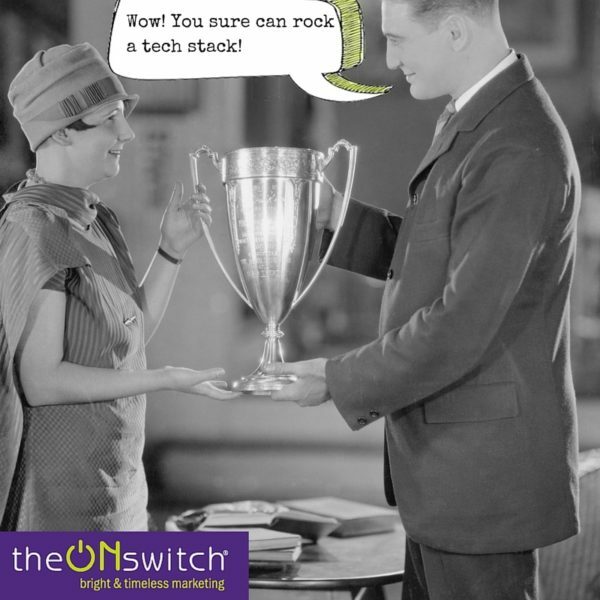 I also learned what DemandGen and Tech Stack mean because they won an award for that too. Your clients and partners will assume (rightfully) that anyone who won is really good at something…perhaps even expert! They are a great opportunity to share good news with the media and on your website (which, in turn, is great for SEO). Slap it up on your LinkedIn profile and resume too. You get to go to acceptance dinners and ceremonies, which if done well are in good places and can be really fun. If you don’t win, they aren’t as much fun…but you need to be gracious and happy for the winner. You don’t want your face to look like some of these. So, how do you get one of those cool cleverly-named awards? Many industry associations have awards, which they include in their annual conferences. Local chambers and publications often have targeted awards. Just Google your specialty plus the word “awards” and you’ll find others. Look at who won last year. Pick the category (or categories) you think you have a shot at winning in. Sometimes you may need to pay for an award application. Don’t fret. Organizations need to cover their administrative costs. But beware of scammy awards, where you just have to pay a fee to be included on some long list. You won’t even get a glass of champagne. If you win, be sure to include and thank your co-workers and collaborators, your agency, your consultants, your loved ones, and anyone else who played a role in the work that led to victory. Although you may only get one lucite embedment, most victories would never be won without a team! Oh…and be sure to look in a mirror, comb your hair and put on some lipstick (if you’re a woman) at the awards ceremony. And don’t drink too much, If you win, you’ll probably have your photo taken with the presenter. You’ll have the award in your hand, but you certainly don’t want to have red eyes and kale in your teeth! Celebrate the small wins too. Here’s why. Not all trophies are designed wisely. Some bizarre examples. Well done Nancy! Yes – results, results, results count! If you can’t count the results, don’t count on winning!